AD-18/G-2210 is an omni-directional, vertically polarized V/UHF antenna for ground-to-air and ground-to-ground mobile communications in the 225 to 1000 MHz range. It is intended for use on vehicles, but can also be affixed to a mast using an optional mounting bracket. 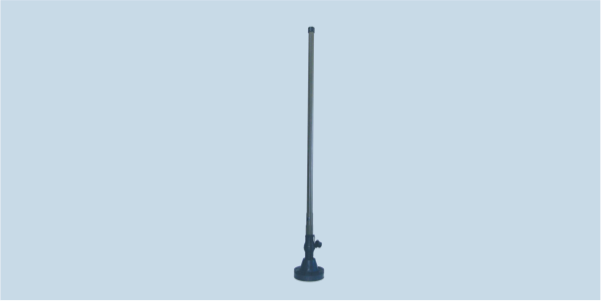 AD-18/G-2210 is a wideband dipole vehicle antenna intended for 225 to 1000 MHz use, mainly intended for use in heavy duty mobile applications. The antenna is composed of two main parts: a radiator and base. The radiator is made of 28 mm diameter fiberglass tube with special radiating elements firmly placed inside. The antenna base has built-in biconical spring to protect from mechanical impacts. Electrically, the antenna is designed as a center-fed dipole thus the electrical characteristics are independent from the ground or mounting surface. The antenna base has an optional built-in active GPS antenna. The antenna base has four mounting holes equally spaced on a 4.5" (114.3 mm) circle which complies with NATO standard. Different base plate dimensions are available on request. The antenna radiator is painted with military green (RAL-6014) two-component UV resistant paint.